The Galaxy S10 series marks an anniversary for Samsung – ten years ago, the first Galaxy S was launched on the market. Since then, the series has grown into one of the largest iPhone competitors and Samsung the world’s largest smartphone maker. Samsung offers four different Galaxy S10 models this year: the S10e, the S10, the S10 + and the S10 5G. We put the Galaxy S10 + through its paces and found out a detail that Samsung would rather have kept secret. The smartphone comes with the current Android version 9 Pie, over which Samsung has laid its new One UI interface. Compared to previous UI versions from Samsung, One UI has been simplified and has become cleaner. In addition, Samsung has tried to make the interface more usable for large screens. But in many apps, the content moves down to be faster to reach. The operation went smoothly from the hand, even complex games could not force the S10 + to its knees – even after I had the screen resolution on the maximum setting up. Immediately after unpacking, however, I first installed the simulated Google Pixel Launcher and I recommend anyone to do the same. I did not even try the Samsung launcher “One UI Home”, but it will work for most buyersin orderhis – no more. Left hand is Bixby Home, with an overview of appointments, reminders, the weather, and a whole host of unnecessary things that Samsung judges to be interesting and worth seeing for some reason. The rest is a simple launcher with home screen and app shelf. As alternatives, I recommend the Rootless (Pixel) Launcher or the Nova Launcher, these simply make the smartphone life better. The Galaxy S10 + has up to a terabyte (TB) of memory, which can be expanded in the dual-SIM model by up to 512 GB via MicroSD card. The 1TB version has 12GB of RAM, and in the 128GB and 512GB versions it is 8GB. Our test device has 512 GB of memory and the dual SIM function, so it can even be expanded to one TB. Compared to my private OnePlus 6T, the Galaxy S10 + was not faster at unlocking, nor could it better recognize my finger. After all, the smartphone can also be unlocked when the screen is off, that does not work with optical sensors. With some screen protectors unlocking does not work properly. After all, Samsung is now wearing a protective film from the factory, but who has to buy a foil, should pay attention to the compatibility. In the Galaxy S10 + puts a 4100 mAh (mAh) large battery, which has brought me in normal use easily through two days or more. The Akkukann can be quickly charged both with the enclosed power plug and wirelessly – with the appropriate charging station. Both variants support 15 watts input power. Especially with the wireless charging function is that it can also be used for reverse charging. This technology is already known from the Huawei Mate 20 Pro. This allows, for example, other smartphones are simply charged, in which they are held on the back of the Galaxy S10 + – if they themselves can be charged wirelessly. Samsung is one of the last manufacturers to install a jack in their premium smartphones. I’ve been using Bluetooth headphones for a while, but it’s always good to have options. Samsung even adds a few AKG in-ear headphones to celebrate the latch. Of course, the S10 + also has a USB-C port for charging and data transfer. In addition, Samsung’s “DeX” desktop experience is also supported, so the smartphone can be connected to a screen and used almost like a full-fledged PC. Can the Xiaomi Mi 9 actually be as much as a Galaxy S10? As in recent years, Samsung has again installed the best AMOLED panel on the market. In the S10 + it has a screen size of 6.4 inches and a resolution of 3040 x 1440 pixels. The display supports HDR10 + and is protected by a layer of the latest Gorilla Glass 6. Like its predecessors, the Galaxy S10 + has a front with rounded edges that surround the AMOLED display. I am a little annoyed by the different widths of the screen edges above and below. It’s still the bottom edge, which is a bit thicker – as with almost all Android smartphones. Apple has found a better solution here, which apparently could not be adapted by other manufacturers. Samsung has completely bypassed last year’s Notch trend and is introducing the S10 to its 2018 “Infinity-O” technology. This means there is a small opening for the front camera in the screen. 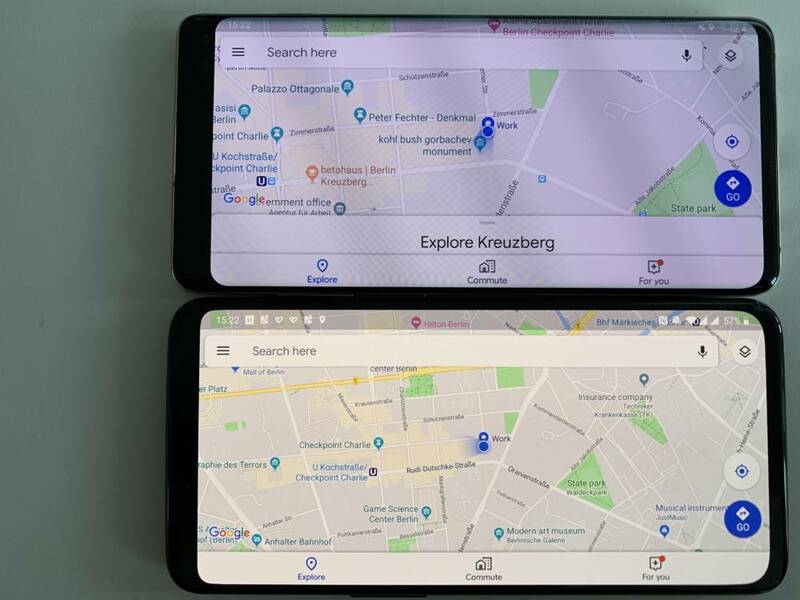 The Galaxy S10 is the round neckline on the top right of the screen and did not really affect me in the use. You might be bothered by the fact that the section of screen that nestles around the hole is lost space. As a result, the line, down to which a gapless image is possible, moves further down. If you do not mind a small gap, you can also maximize the image from edge to edge. What bothers me personally, is the fact that in the S10 + the cut-out for the camera (s) is wider, because in addition to the normal selfie cam still sits a depth sensor. I think Samsung should have set here as the Galaxy S10e and S10 on a software solution that calculates the depth of field. Because the accuracy is only slightly increased by the sensor and a smaller, round hole would have simply been better. However, you can use the camera pill to good effect – and as eyes for known characters. 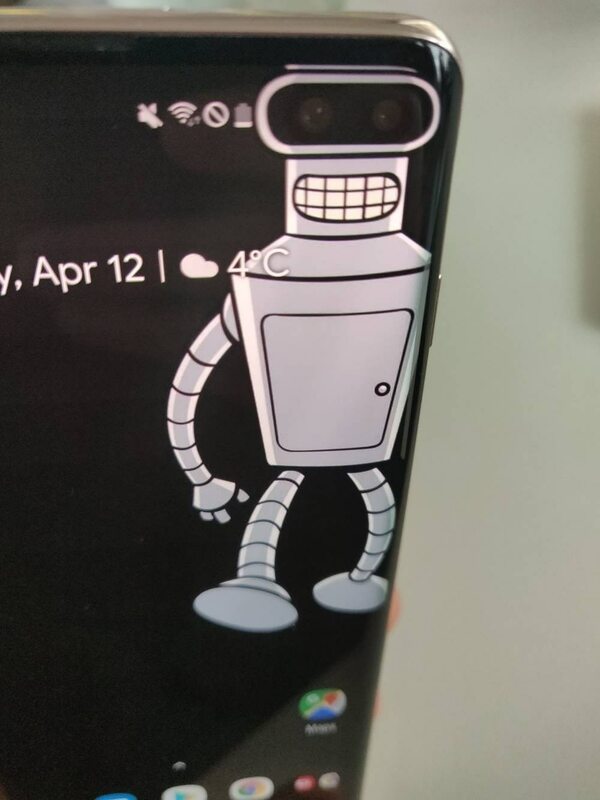 Already for the round camera, Galaxy S10 users have come up with funny wallpapers, but with the Galaxy S10 + it gets even better. My favorites include Bender, Wall-E and the good old Mars rover Curiosity (RIP). We got to test the S10 version with ceramic back, which should be slightly thicker and more resistant than the glass version. The ceramic version weighs in about one-eighth more (about 25 grams) than the standard version with the back Gorilla Glass 5. A Word of Warning: The Galaxy S10 + is incredibly slippery! If you place the smartphone on a minimal sloping surface, it starts to slip after a short time. It has fallen out of my coat and trouser pocket several times, because it is unstoppable even by friction. But at least, except for a few scratches, it did not get anything, so the endurance test passed with flying colors. Also, the case is waterproof and dustproof to IP68, which means that the smartphone can withstand a dive up to 1.5 meters for 30 minutes. Samsung has long kept the camera simple, with a camera on the back and one on the front. The Galaxy S9 + was the first smartphone in the series, which also had a telephoto camera next to the main camera. With the Galaxy S10 +, Samsung goes one step further and now installs a triple camera. It consists of a 12-megapixel wide-angle sensor with optical image stabilization (OIS), a 12-megapixel camera with OIS and two times magnification and a 16-megapixel ultra wide-angle sensor. This is not yet Penta-Cam territory as in the Nokia 9 Pureview, but still a whole bunch of cameras. Here are some sample images comparing the three different cameras. Also, the front has a dual camera, this is a 10-megapixel selfie camera, which is supported by an 8-megapixel depth sensor to improve the portrait effect. The camera on the back can record videos in 4K at 60 frames per second (FPS) or in 1080p at 240 FPS. Super slow motion in 720p resolution with 960 FPS is also supported. The camera app is very well structured and clear. With a small switch, which hovers on the right above the viewfinder, you can immediately switch between the three cameras or in selfie mode between wide angle and ultra wide angle. Incidentally, the slider can also be held down and dragged up or down to zoom in or out – a very handy feature that I’ve used frequently. The transition between the cameras is thus much smoother than with the two-finger zoom gesture. The camera app has an automatic scene optimizer that has delivered good results, especially at night. When the optimizer is turned on, a small ball will show an icon for the scene that has just been detected. Speaking of intelligent function: At the very edge of the screen is a button that opens Bixby Vision. This works much like Google Lens and should recognize objects that can then be searched on the Internet or bought directly. This works well sometimes, but sometimes not at all. For example, Bixby Vision partout did not want to see any cent coins and instead make it clear to me that there would be pliers, a toothbrush and glasses. For things like cups, headphones or computer mice, the hit rate was quite good. What bothered me a bit is the car time-out of the camera app. After about a minute of inactivity inside the app, the smartphone simply returns to the home screen – I can not say how many times that happened to me when I was waiting for the right moment for a snapshot. It is not widely known that Samsung in principle manufactures two different versions of its flagship smartphones. In addition to Samsung’s own Exynos processor chips, there is also a variant with a Snapdragon chip from Qualcomm. The practice, which has been operating since the Galaxy S2 of 2011, was originally probably introduced to meet the high demand. The Galaxy S10 + is no exception. There is the international version with Exynos chip and the Snapdragon version, which is distributed only in the USA, Canada, China, Japan and Latin America. We have tested the Exynos version, as only this is available in Germany. The Galaxy S10 + is an excellent smartphone and certainly a candidate for the title “Best Smartphone 2019”. That’s why it is all the more annoying that as an Exynos buyer to accept the worse performance, the difference was still so small. With a more than 1000 Euro expensive smartphone you should actually expect that you get the best and only the best. So there are only 4.5 out of 5 stars in the final rating, at least for our Galaxy S10 +.